And since schools spend a huge chunk of the year prepping your child and administering tests from Pearson and companies like Pearson what are we saying schools view children as or as a society as a whole? Food for thought… in this next link is a posting from just another blogger. I can’t verify her experience or even give credit to the truthfulness of her post but it gives a scary perspective to what happens after a student is put through the process of testing. I can’t say I even agree to submitting students to the stress and rigor of testing in the first place. I feel the validity of test scores are questionable. But even if we don’t consider who writes the questions, why these specific questions are even considered good measures of a student’s intelligence, or how appropriate it is to gauge student success by a single assessment each year without considering their whole human development – Even if we don’t… and we still end up to the point where we submit the piles of answers for scoring… what happens then? How accurate are they graded? Are they real reflections of a child’s answers? Are these answers accurately representing what a student knows and has learned? Are these questions representative of valuable knowledge? It scares me to think how inaccurate or how lacking in valuable content the questions and data on a test are from the start and then to consider it being skewed afterwards is even scarier. Will Pearson continue to thrive in states like NY or will activists inspire change? The toll of testing seems to be hitting the forefront of the education field, students, teachers, and families on a daily basis. There is a lot of buzz and some advocates pushing for opting out. One can only hope that enough buzz and push back will change education in a way that will end test-driven curriculum and high stakes testing. Take a moment to research and be informed on testing. Explore the controversies! Explore your perspectives! 1. Yes, you are correct all they are doing is playing and by definition “Play” is an activity that has no purpose or objective outside of pure enjoyment or amusement. But of course I am sure you have never benefited or gained any new knowledge or information from an activity that you chose simply for enjoyment. No… Wait don’t forget your ginseng green tea, wouldn’t want your brain power to diminish on the way to your yoga class, soccer game, happy hour ( you don’t say? Your best ideas pop up in your head during those “free moments”). It’s a shame that can’t happen for children. Free moments were amazing ideas are born… Don’t get me wrong I love tea and yoga but what have I done in my 30 years of life that justifies my right to play over a child’s. 2 – I know, unbelievable! After all how could they be learning while playing. Can’t quantify that! Can’t measure it on a scale. No # assigned to it. I’m sorry you only have 75% performance while digging that bucket full of sand… I don’t care that you just learned the difference between More and less Or Heavy and light, Or how not to knock out Johnny in the side of the head when he takes your shovel. Because really are those foundational math and social skills that important? 3 – so there is this famous physicist, he invented the theory of relativity “all motion must be defined relative to a frame of reference and that space and time are relative, rather than absolute concepts”. Einstein. Oh, yes! You know him. 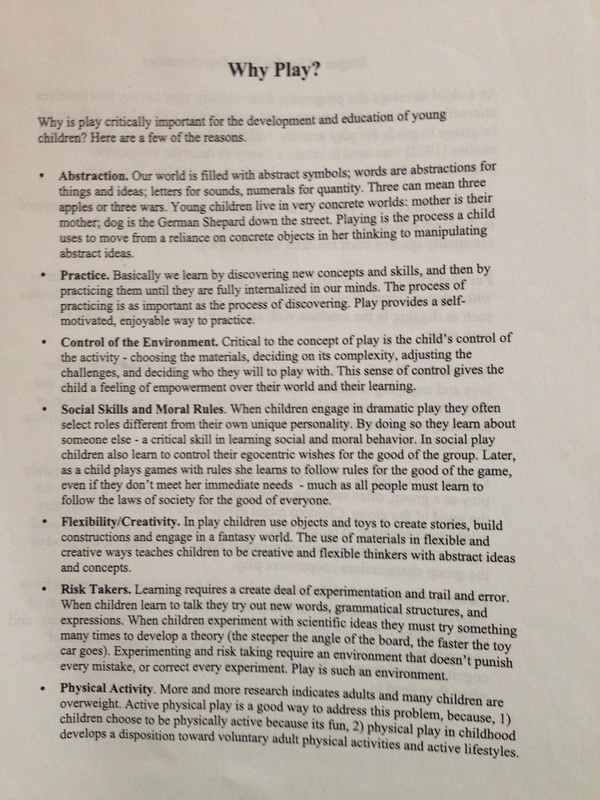 He also says “play is the highest form of research”. 4 – you know I have to tell you… There must be some sort of conspiracy going on here. 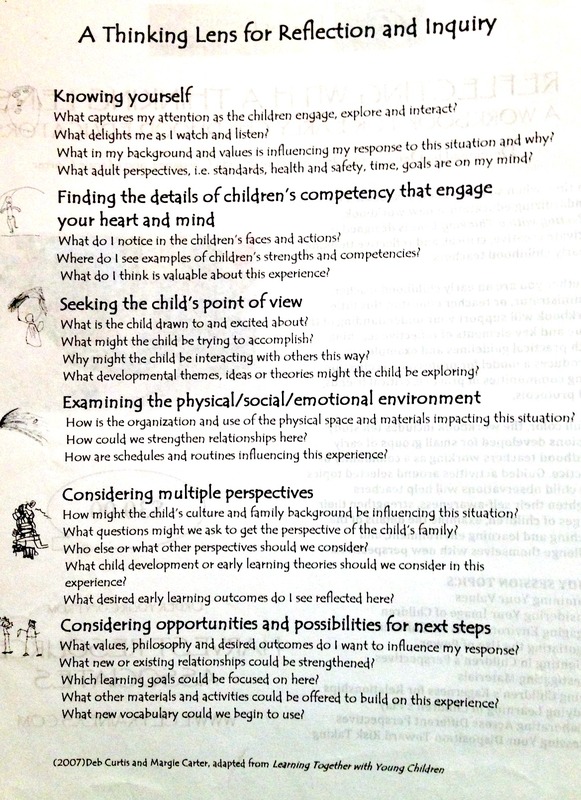 I mean some group of people got together and gathered all this supportive research and studies, wrote these super expensive books, conned hundreds of educators to attend seminars, even convinced me to spend over 60,000 dollars on a piece of paper from higher education institutions… Simply to make me falsely believe that supporting whole child development through active and hands on, authentic, meaningful, interest based experiences is how children learn best. Wait that’s play… And suddenly that concept kinda seems maybe slightly true? To me but still not to you. 5- 3 years ago David Bornstein of the NY times in response to recess cuts blasted that … More than 150 years ago, Charles Dickens created a fictional character, in the novel “hard times” – Thomas Gradgrind – a schoolmaster whom had no use for play or imaginative pursuit of any sort, if something did not demonstrably add to the productive capacity of the nation and could not be justified with facts and statistics, it had no place in a child’s education. Dickens invented Gradgrind (and introduced him in a chapter entitled “Murdering the Innocents”), emphasizing the focus on rational pursuits and quantitative measures over all else. Eerily this seems to mirror today’s times. 8 – 20 or less minutes of recess. 13 – 74.3 million children left behind. 14 – While watching your child play today, soak in their laughter as if it will shield you from the hot burn of the sun. Let the air fill with the rise and fall of their soprano giggle and watch as their eyes light up with wonder as they discover new things. And when you ask them what do you notice? How do you know that? Tell me about that… Let the windows open up and flood you with breezes of knowledge. Because while your child may be able to count to 100, chant out the letters of their name, or match a shape to it’s name – take a moment to be a part of what they really know. Let them share their ideas and observations of the world. Hand them the keys and allow them to open the door to the “100 Languages” they have to offer you. Because red is just red until a tomato bursts between your teeth, and 100 seems small until you count the turns of a tricycle pedal while your small feet press them vigorously in rotation, and a triangle is a just another 3 pointed vector until it stands for home on a map or the bottom of a marking stamping love in a card. Round is just another adjective until it is spotted in the concentric circles and curves of feet scribing the words “I was here”, trailed across wet sand. 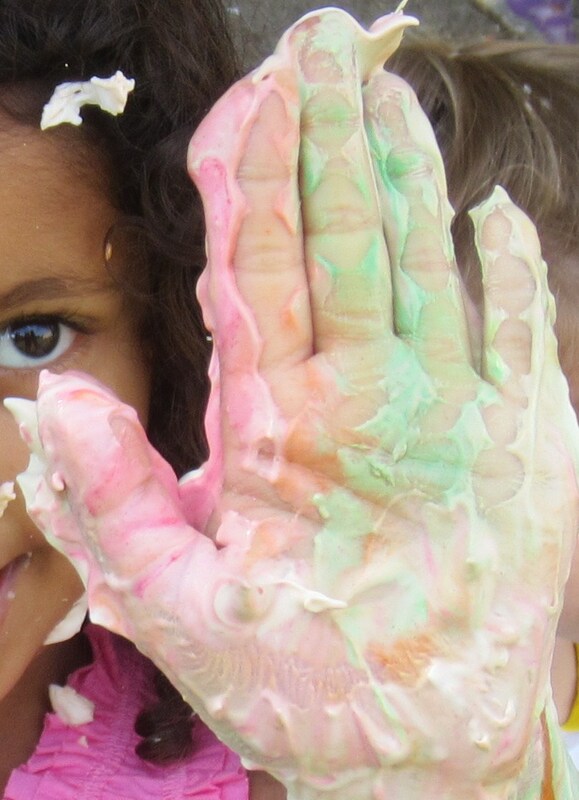 When skills no longer become splinters we save up to burn for good test scores, but meaningful impressions we have gathered through our journey of life – is when PLAY will truly be honored as a means to learn, to stretch, to grow, to explore and succeed. 15 – We do not listen to the voices of the young. They tell us I am learning, I have discovered, I have come to know… but we turn our backs to them. Plato once said, “Our children from their earliest years must take part in all the more lawful forms of play, for if they are not surrounded with such an atmosphere they can never grow up to be well conducted and virtuous citizens”. But we steal these moments from them and then ask them to be whole. We never consider that by trading A and B for C and D – we might get results we never desired. We can’t turn back a clock and give them these years back – when we find tears in their eyes from the pressure of failing, a gun in their hand because their sense of community is lacking, a pile of pills to pop, and irrational liquid fire impulses to stop, what can we say to the children once they have grown – but that we have failed you by not leaving you and PLAY alone. Play brings Joy – Happiness – and purpose to our lives! PLAY simply should exist in children’s lives (and adults) for the LOVE of PLAY! Yet, we are still wanting evidence that it somehow supports academic progress, success, and proves PLAY has a deeper purpose! Guess what! It does! 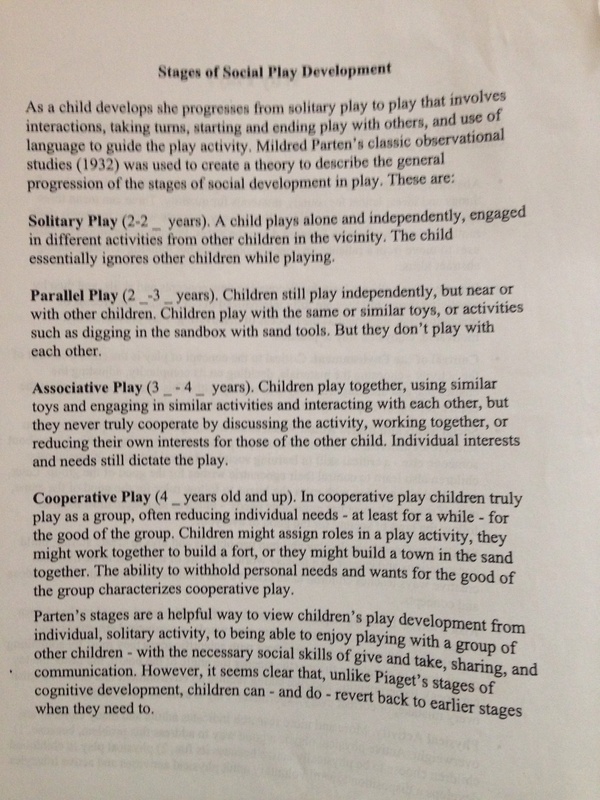 Have resources on the value of play? Please share!